1월초부터 시작한 150호 자장매는 이제 정점을 향해 달리고 있다. 마지막 단계만 남았다. 새로 시작한 120호 두 점이 연결되는 설중매도 무사히 중반을 넘었고, 50호 백매 30호 홍매도 기분 좋게 진행되고 있다. 마치 마라톤을 하듯 달리고 있다. 첨부한 작품은 이전에 그린 것을 새로 업데이트 한 작품이다. 2019년 봄은 매화와 함께 환상으로 빠져든다. Am I dreaming or not. I am falling in to fantasy on 2019 Sprng with Maehwa. 이 작품에서 가장 중심된 표현은 기운생동(氣韻生動)이다. 자장매의 신비로운 기품과 기운 그리고 살아 숨쉬는 생명력을 나의 체질로 캔버스에 담았다. I am glad that I finished the big painting of the Snowy Jajang Mae. It took over one month. Enjoy with the vibrant energy. 1. 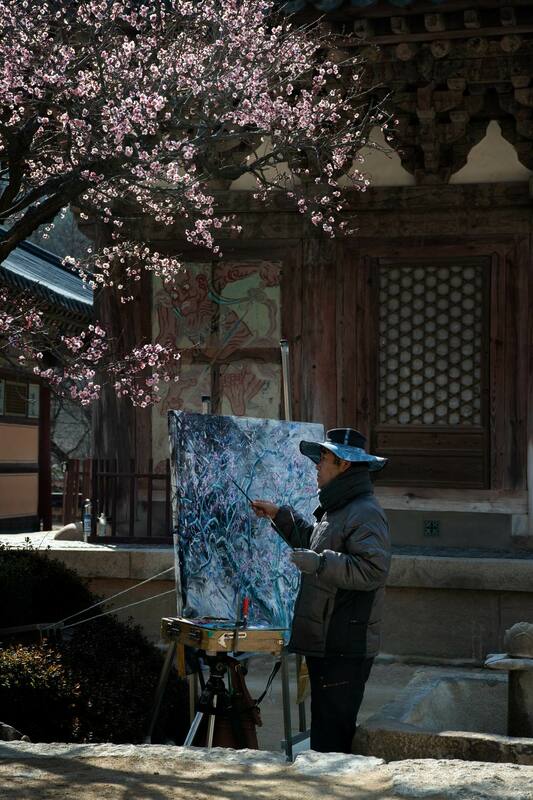 This exhibition introduces Kim ChangHan who is the Korean artist who have been drawing Korean spirit with modern art. 2. Both paintins about pure, natural theme which was drawn in Korea and Myanmar. 3. Especially spending lot of time abroad and interacting actively with foreigns withen range of interest and quality of art work. 4. I want to be part of cultural development and widening interaction by increasing Myanmar's understanding of Korean culture and advertising it to collectors. 급한거니 최대한 빨리 해주면 좋겠다. 이번 전시는 한국인의 정서를 현대적인 미감으로 독창적으로 그려온 김창한 작가의 작품을 소개한다. 김 작가의 한국에서 그린 아름답고 순수한 자연을 중심 테마Theme로 작업한 그림과 미얀마 현지에서 직접 작업한 것들을 함께 전시한다. 3, 특히 김 작가의 해외 여러나라에서 오래세월 동안 현장 작업한 경험과 다양한 국적의 외국인과의 교류는 미술을 통한 보편적이고 상호관심의 폭을 넓히면서 미술의 가치를 높히는데 큰 역할을 했다. 따라서 미얀마 사람들에게 한국 문화에 대한 이해를 높이고 미술 얘호가들에게 적극적으로 알림으로써 상호교류의 폭을 넓히고 문화 발전에 기여하도록 한다. 설중매(雪中梅) 대작 마지막 단계 주말 전국에서 수많은 사람들이 몰렸다. 오늘도 현장에서 아침부터 해질 때까지 매화나무 앞에서 열심히 매화 향과 황홀한 색채에 감동하면서 캔버스에 담았다. 최종적으로 끝내기 쉽지 않지만 온종일 보고 또 보면서 매화 속으로 빨려들듯 무아지경이다. 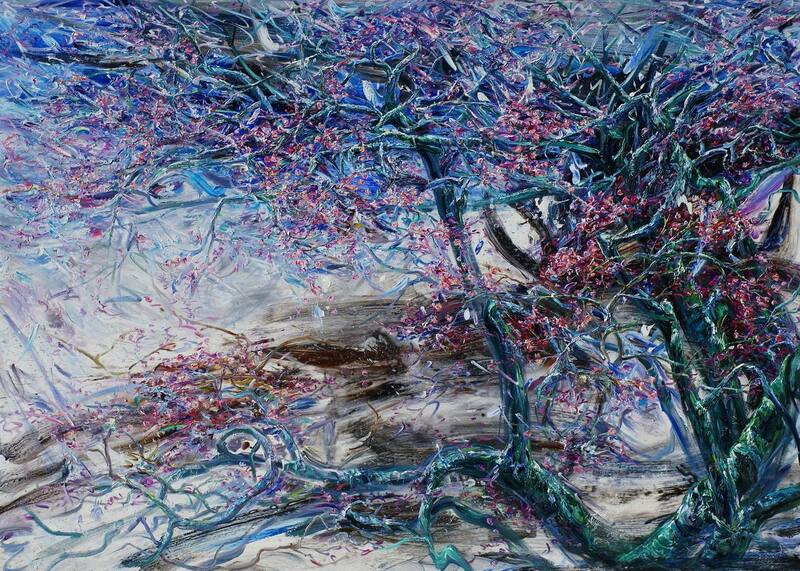 I am falling in to fantasy of the Snowy Maehwa (Plum Blossoms) in the late of Winter. Now it is the last stage of the big canvas of the Snowy Maehwa. 1, 통도사 홍매시리즈에 이어 백매/청매 시리즈도 작업 중이다. 스님들께서도 많은 관심을 보이는데 그중 소율 스님께서 한 말씀이 긴 여운을 남긴다. 3, 수년전부터 통도사 자장매는 1월초부터 피기시작 해서 믿기 어렵겠지만 3월까지도 계속 핀다. 자장매의 절정이 언제인지 많은 사람들이 현장에서 말하는데 대부분 이젠(2월말) 절정이 지났다고 한다. 그러나 나는 그렇게 생각하지 않는다. 지금도 절정이다. 어제 찍은 자장매(홍매) 사진을 보듯 아직도 매화 꽃 봉우리들이 황홀하다. 그러나 흩날리는 꽃잎과 찬란하게 꽃을 피운 뒤 시들어가는 매화는 내게 더 강렬하고 오랜 시간 시선을 사로잡는다. 진정한 아름다움 미의 본질은 무엇인지 내게 질문하게 한다. 막 피어난 꽃은 청춘 즉 20~30대라면 시들은 가는 매화는 80~90대라고 할 수 있다. 치열하게 자신의 사명을 다한 노년은 마치 수백년 된 고매가 진한 향을 뿜듯 더 많은 감동을 전해준다. 어쩌면 이런 것 마저 초월한 것이 영원한 아름다움 일수도 있겠다. 자장매를 중심으로 17년째 한국 고매를 통한 기운생동과 깊은 매화 향을 담으려 노력하고 있지만 매화의 본질적인 아름다움을 담기엔 갈 길이 먼 것 같다. I proud that I finished the big paintings of the Snowy Maehwa. 설중매(雪中梅) 120호 두 점이 연결된 역작(力作)을 완성했다. 기운생동(氣韻生動)과 매화의 향을 캔버스에 담고 싶었다. 그리고 이번 겨울 이곳에 함박눈이 펑펑 왔을 때 느낀 감동을 강조했다. 통도사 매화 시리즈도 이제 종점을 향해 달리고 있다. 위 설중매를 철수하기 아쉬워 이번 주말(토/일요일)엔 현장에서 관객들을 위해 위 그림을 펼칠 생각이다. 이렇게 무사히 마무리 지을 수 있도록 도움을 주신 통도사 관계자 분들께 깊이 감사드린다. Here are some videos to enjoy my art. Recent works are on the main menu of 'Forum'. 조만간 완성작들을 함께 감상할 날을 기약하면서, 오늘은 이만! 몇 일전 새로 시작한 수양매(능수매) 50호 연작도 색다른 맛이다. 약 3개월간 진행된 통도사 고매 시리즈는 다음 주 중반이면 마무리 된다. 이후 지리산에 그림 그리러 몇일 다녀온 뒤 중국에 전시 갔다 온뒤 4월 24일 유럽으로 작품활동 떠나기 전까지 계속 현장 작업은 이어질 것이다. 이번에 그린 작품들은 8월 울산 개인전 때 소개될 것이다. I have many plans to paint and exhibitions in Korea and overseas in this year. Here are the detailed schedule. From March 16 to April 15, I will participate the invited group exhibition at the new open gallery of Neru in the city of Gangjin in Korea. From March 22~25, I will participate the International Exchange Exhibition in China which invited the city of Chowon. From the late of April to early of June, I will visit in Germany (Munich) ~ Luxumberg ~ Franc(Paris) ~ to paint. In July, I will visit in the national waterfall and mountains in China to paint. Include in Beijing and Nanning. I will have solo exhibition in August which supported by the Ulsan Arts And Culture Foundation. From October 18~24, I will participate the International Exchange Exhibition in China. I am invited to have solo exhibition by the Viking Gallery (Tamborine mountain, QLD, Australia) from October 17 to 30. Enjoy with my Maehwa series. I will try to post more soon when I get back from a short trip to China for the exhibition. See you. 1월초부터 시작된 매화 현장작업은 3월말 혹은 4월초 까지 계속 진행됩니다. I had very good time in China. It was the first time to trip the country with my art but I had many times that I participated group exhibitions. But I couldn’t go there as I was a full time art teacher at a high school of arts. Now I am a full time world artist. This time, I visited in Yantai and Zhaoyuan. There is a good news that my chinese were interested my art especially the head of the Ministry of Cultural in the city of Zhaoyuan was very interested my art and he suggested me to have a solo exhibition in the city next year. He wanted to decide the date of my visiting and exhibition. But I couldn’t answer as I have many art plans and I don’t know exactly the blooming season in the city. So I need to check many things to paint there and to have a solo exhibition in the city. Meanwhile, I am planning to visit Chin in July for four weeks. Still I couldn’t decide for the visiting place but I hope to visit in the famous mountain area in Hwanggasu waterfall, Hwangsan, Jang Liang’s Tomb and Guirin. Of course I will visit in Beijing and Nanning to meet my Chinese friends. It will be very exciting plans. I am waiting the day will come soon. By the way, may I ask you a question to translate in English and to translate in Chinese in the followings? 1, Thanks a lot for sending me the recent news. 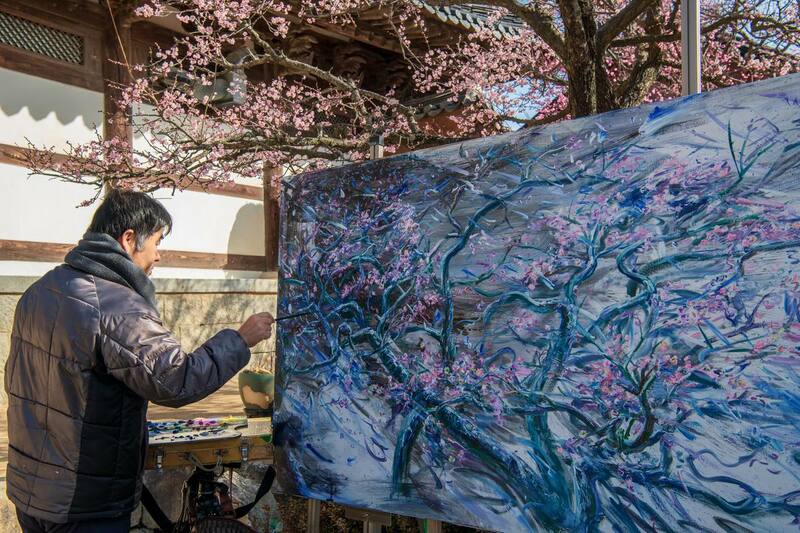 2, I arrived in Korea safely now I am painting again for the blooming blossoms. 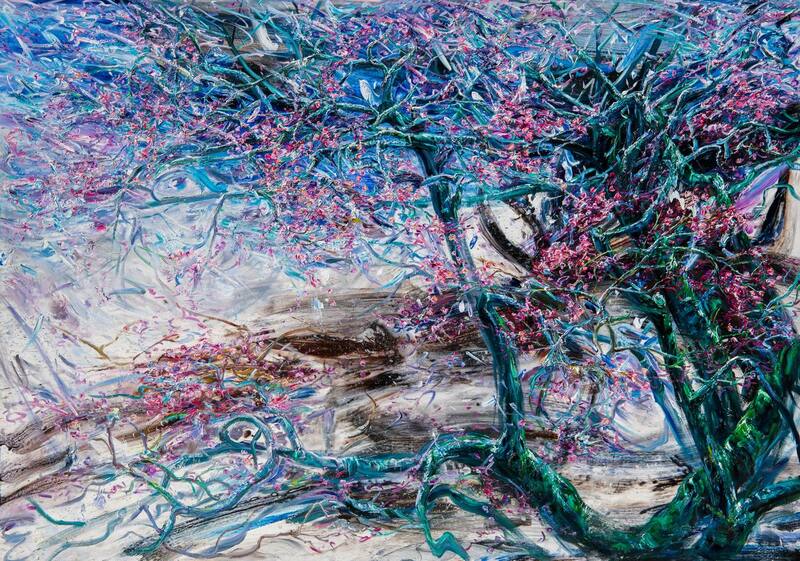 And preparing the upcoming group exhibitions in April and preparing the world art tour. 3, So I am very busy but it is a very exciting season with the art. 4, I will prepare to send you my special art-book, pamphlet (catalogue), profile, CD or USB which can see a selected my videos of art. 5, I have many painting and exhibition plans in this year as follow. Visiting in France, Germany, China, Australia, Myanmar. from the late of April to December. 6, It will be very exciting to meet the Chinese artists in Korea again for the exhibition in Seoul. I will get the airport to see them for guide and will be together. 7, I am very glad meeting with you in the city and you like art very much and the great interesting of my art. I will try so send you more about my recent paintings. It was a great time visiting in China not only for the art but also the people, food, nature and so on. Most of all, I had a good results that I was invited a solo exhibition by the city/art association. It was happen by accidently announced by the head of the Ministry of Cultural in the city of Zhaoyuan when we having an exhibition reception. It was a big hospitality and warm-hearted message about my art. Actually the head of the Ministry was interested when I arrive in the city. So he wanted to be a WeChat friends. There are too much to say about the beautiful China and Chinese but now my time is very limited as I need to concentrate my art from tomorrow morning for the blooming blossoms. Hopefully to post more about the beautiful and friendly country. See you. 금번 한중교류전에서 가장 큰 성과는 내 그림에 대한 중국인들의 특별한 관심을 확인한 것이다. 여러 사람들이 있었지만, 그 중 금번 행사의 총 책임자인 우조리(초원시 문화국장)님의 본인의 작품세계에 대한 특별한 관심으로 초원시/미술단체 이름으로 개인전을 열어주겠다면서 오픈식후 열린 만찬 자리에서 발표했고 곧 초청장을 보내겠다고 했다. 아울러 내가 원하는 희망 날짜까지 물었는데, 이것은 매우 뜻밖의 일이었다. 사실 내년에도 여러 지역에서 작품 활동이 예정되어 있기에 바로 답할 수 없었다. 추후 서로 의논하기로 했다.